The March winds roared the new month in on Thursday afternoon. That morning mournful rains assist-ed at Sharon Patton’s Requiem. She was named for the Rose of Sharon, one of Our Lady’s titles. Some say the flower is actually the crocus which each year serves as Spring’s harbinger. Three blossomed in my garden the morning of her funeral. The church was full of family and friends and faithful for the Solemn High Requiem. This was a finer tribute than ever a eulogist could give. Afterwards Marlys and the ladies of the parish provided a tasty lunch for a packed Helfta Hall. Afterwards Fr. Lehtoranta read the burial prayers at the cemetery through wind and rain. It was the first day of St. Joseph’s month. Many thanks to Mark Lotarski and all of those who work behind the scenes. Thanks to all of you who helped pay for the funeral, and so quickly, with the Go Fund Me site. We appreciate once again the charity and cooperation of Mueller Funeral Home. May the many who owe so much to Sharon Patton for her years as a School and Sunday School teacher pay that debt now by charitable prayers for her soul. “Pay it forward,” too, won’t you, by helping educate our children, your children, in the faith? There’s so much you can do. Who else would do it? Some of our children still do not know how to genuflect or make the sign of the cross properly. Catch them, show them kindly. You’ll be continuing Sharon’s invaluable work. Keep her soul and her family in your prayers. I must say a word about Bishop Selway’s consecration on February 22, which now seems so long ago. The four hour ceremony was splendid, solemn, and most prayerful. It moved along majestically, without a hitch, but also with a prayerful recollected air. I was very proud of our priests and servers from St. Gertrude, who per-formed their duties to everyone’s edification. We were all enchanted with the fabulous, unforgettable music. Three hundred people were in attendance. It was good to see our far flung priests again, Fr. Larrabee, Fr. Saavedra, Fr. Palma, as well as young Fr. Eldracher, otherwise cutting his teeth in the challenges of the Australian mission. Afterwards there was a proper sit down luncheon outside, under a tent, graced by our guests, clergy and four bishops in their billowing purple ferriolos. The school children served, and very well. Thus the Church continues. Deo Gratias to the Lord who gives and the Lord who takes away. Word has reached us of the death of Bishop Hesson late last Summer. I had helped teach him how to say Mass when first he joined us at Oyster Bay back in the early eighties. He helped us with our church in Eddy-stone, Pennsylvania. 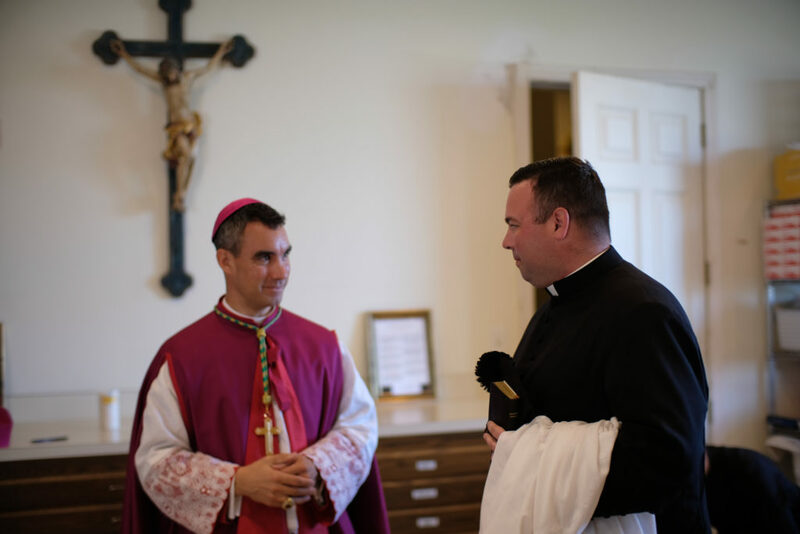 While he was consecrated a bishop, his apostolate was always rather limited, as is sometimes the case for one reason or another. Say a prayer for his soul, and that of the other deceased bishops and priests. I almost forgot the Children’s Day of Recollection! I knew there was something else. What a busy week it was. 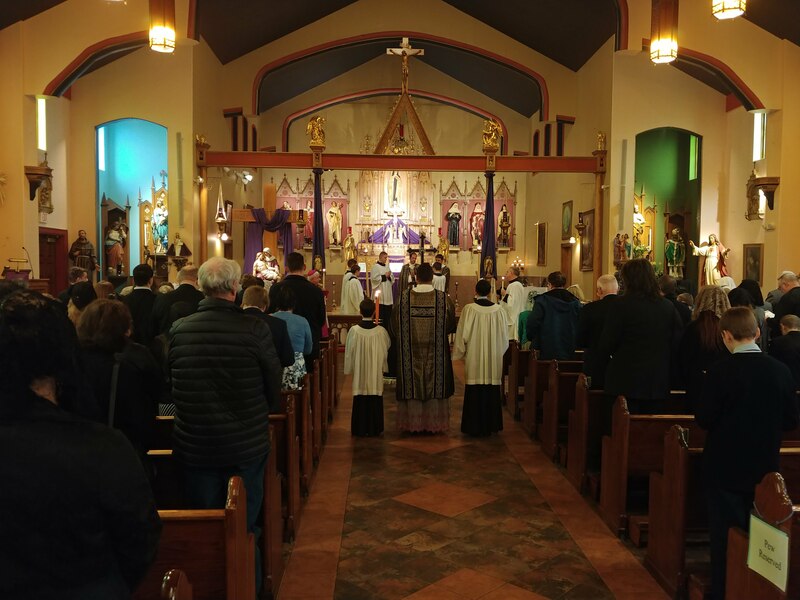 Most of our public school families forgot it too, but most of our home schoolers remembered and joined our own students for a great day of moving talks, prayer, Stations and Benediction, and most of all, Holy Mass. I had some great stories that afternoon for the little ones, but the Children’s Stations most of all touched me. They are the same Stations I remember from St. Suzanne in Detroit where I went to school. It always moves me to hear again this beloved childhood devotion. Thank you for helping us train a new generation in the traditions of our faith. Another Way of the Cross, short and quite practical, is slipped in on Sundays during Lent between Sun-day School and the 11:30. These Stations are very short, but at least provide a possibility for “making the Stations” when you’re here already. One stop shopping. The main thing is for the children to know them and pray them. Our Lent got off to a rather slow start, what with the Consecration of Bishop Selway, but now we’re hit-ting our stride. Good attendance at the weekday morning Masses continues. Have you been? And to a Friday Recollection? Next Sunday is already Laetare, or Rejoice Sunday, marking Mid Lent. The Sisters are planning quite a Sister Sunday, so you’ll want to get in on it, and support this charitable cause. Every Sunday is a “little Easter,” remember. And Easter will soon be here. 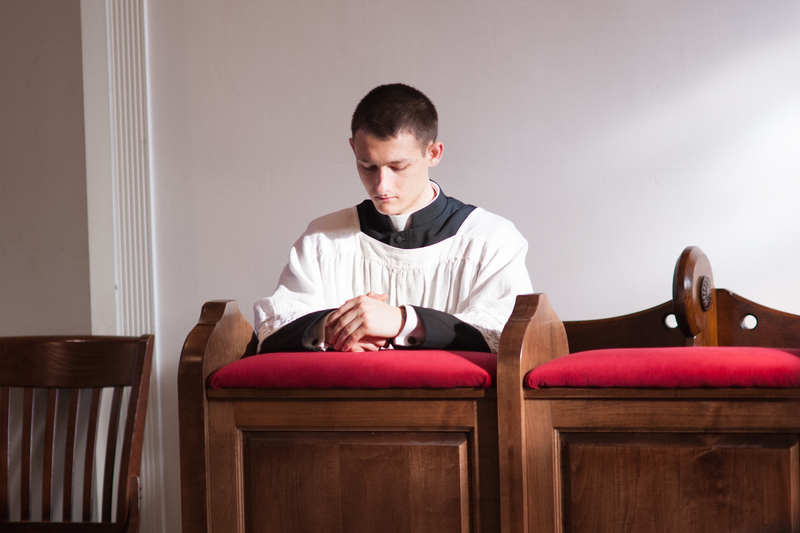 On weekdays, be regular and generous in your penance. The McFathers are off on their rounds this week-end. Fr. McGuire is covering for Fr. Francis, OFM at Christ the King in Lafayette, Lousiana, and giving a weekend of recollection. His theme is St. Therese. Fr. Francis is in South Africa to take care of the lone “sedevacantist” or Catholic in that poor country. Fr. McKenna is making his northern rounds. Last Monday he conducted the funeral of a very devoted Catholic, Elaine Pawinski, grand or great-grandmother to some of our own. This entry was posted on Saturday, March 3rd, 2018 at 5:59 pm	and is filed under Announcements.